(PhysOrg.com) -- Ford has announced a partnership with San Jose-based solar panel vendor SunPower that will offer cars powered by rooftop solar panels. The panels will be installed by SunPower in the customers home, in a package deal priced at around $10,000. Prospective owners of the 2012 Ford Focus Electric can choose the solar option, to offset around 1,000 miles of driving a month. Ford will start producing an all-electric version of the Ford Focus later this year, and will sell it in California and New York this year. The wider rollout, to some 19 locations, will begin next year. The system will also be compatible with Fords plug-in hybrid C-MAX -Energi. SunPowers E18 series solar panels can produce around 3,000 kWh of electricity annually. Ford customers installing them on their rooftops can expect about 147 square feet of roof panels, in the form of 11 panels, 4 feet by 2 feet, designed that way in order to accommodate a driver who clocks in about 1,000 miles monthly. The SunPower systems will come backed by a 25-year warranty. The solar equipment package is to include software so that the customer can monitor the solar panels performance online, using a Web application or iPhone app. 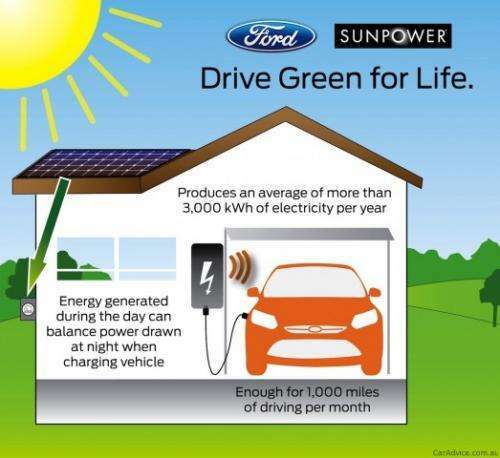 The Ford-SunPower partnership is viewed as an apparent win-win strategy for both businesses. Ford gets to strengthen its public image as an ecologically responsible auto behemoth, which is leading, instead of reacting to, environmental awareness. SunPower gets to extend its customer reach and branded presence as leaders in solar panels and systems. Since the Ford Focus Electric runs on batteries, the solar package option represents an opportunity for the environment-conscious driver to score higher points on the Green scorecard. Although a driver already gets to cut dependence on imported oil via an EV, the owner still faces criticism from environmentalists who point out that electricity from the grid may come from coal and other fossil fuels. Charging up with solar panels engenders less pollution and a lower electricity bill. Ford hopes to electrify as many as one-fifth of its vehicles by 2020 to reach the company's goal of helping to "stabilize the atmosphere," according to Mike Tinskey, director of Ford's global vehicle electrification effort. Overall, Fords electric-car roadmap includes the Focus Electric, and subsequently the C-MAX Hybrid, and the C-MAX Energi plug-in hybrid. Awww... I thought they were going to start selling cars powered by built-in solar cells, like the impractical ones we made back in college but more... well, practical.